It’s Harvest Time!!! This month, Cub Scouts learn about raising animals, growing crops, and the life of a farmer. Dens might learn first hand about farm animals by visiting a farm, dairy, or petting zoo. Boys can build a miniature greenhouse to start seeds for later planting in family gardens or patio pots. Dens could take a field trip to a pumpkin patch, a farmer’s market, or an orchard. Hold a pack harvest fair with rubber glove cow milking, pumpkin decorating, butter making, contest booths, and a good old-fashioned hayride. ü Spiritual Growth, Boys will gain a new understanding of God’s creations s they see the wonders of life in plants and animals. 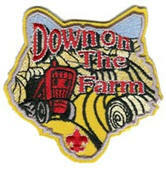 ü Fun and Adventure, Boys will have fun as they see farm animals and explore the grounds and buildings on a farm. ü Character Development, Boys will learn patience and responsibility while working with animals and plants. ü Resourcefulness, Cub Scouts will see that farmers need to make use of many different resources to be successful in raising animals and plants. When you eat breakfast tomorrow morning, thank a farmer. He grew the corn, wheat, and rice in your cereal. He raised the dairy cows that gave you milk. When you eat lunch tomorrow, thank a farmer. He grew the wheat for your bread, the peanuts for your peanut butter, and the fruit for your jelly. People have said to me, Baloo is used at more RTs than the official stuff. If that’s true it’s disturbing. It is, also, not the purpose of Baloo. Baloo is intended to supplement “CS Program Helps” and “CS RT Planning Guide” and “The How To Book” and other publications just as a Pow Wow book supplements those publications. There are ten purposes to Cub Scouting and twelve Core Values; the BSA materials suggest activities to help Cub Scouts learn those purposes and values in a subtle way (“More is caught than taught,” we always say). The CS RT Planning Guide has notes explaining why certain games, songs, skits, etc., were chosen and what value or purpose they help the boys learn. Please be sure to read through these materials before planning so you know how to properly focus your meetings. Baloo may be a great collection of Cub Scout stuff but please use it with care. First, learn what National wants you to accomplish with a theme. Then use your resources to plan a program to accomplish that goal. There are also suggestions for your Pack’s or Den’s First Months. And a New Den Leader Kit i.e. a kit to help a new Den Leader get started. I tried the themes button to see what was there and to see if I could find the 2009 – 2010 themes for Sandie who sent me a note asking if I knew what they were (Boy, talk about planning ahead!! ), but they are only listed through the 2008-2009 Scouting year. Rather listen than read?? Go to the Cubcast, a BSA Podcast for Cub Scout Leaders. Start at www.scouting,org, then click Adult Leaders under Cub Scouts, then Cubcast. The Focus says to learn about animals and plants, so you might, also, want to look for themes relating to that. National makes a patch for every Cub Scout Monthly theme. This is the one for this theme. Check them out at www.scoutstuff.org go to patches and look for 2007 Cub Scout Monthly Theme Emblems.